The coyote, like ourselves, is very adaptable and is continuing to expand into a range of habitats. Unlike other species, the coyote is very capable of surviving and thriving in urban settings. Because of this, it is important that we know how to safely live, work, play and grow with coyotes in the province of British Columbia. Coyote (Canis latrans) is a midsized wild dog species. They are the most numerous wild dog species in the province. Smaller than a wolf, yet larger than a red fox, mature coyotes in BC including their tail are 1-1.3m long and weigh approximately 10-20 kg. They have a bushy black-tipped tail which is usually carried down when running unlike wolves that carry their tails out behind them. Coat color varies geographically and can range from grey to reddish with darker areas along the back and lighter areas underneath. They have a slim pointed muzzle, tall prominent ears, long legs and small feet. Where threats are limited coyotes may be observed throughout the day, however more commonly they are active during dusk, dawn and through the night. Diet is made up primarily of small mammals such as mice, voles, ground squirrels, rabbits and hares and they can therefore provide effective pest control. Carrion can also make up a large portion of their diet, and is of particular importance for winter survival in many regions. Additionally they consume ungulate young, birds, insects, snakes, fish and plant matter including berries. Studies have shown that in some regions coyote predation on ungulate young particularly that of deer or bighorn sheep is the largest cause for ungulate young mortality. Coyote populations can be cyclical in areas where their primary food source is cyclical, such as those observed in snowshoe hares. This can cause local coyote populations to increase rapidly over short periods of time. Coyotes mate from early February to Mid-March, producing pups in April to mid-May after a 60-63 day gestation period. Pups are most commonly born into dens dug into soil; many of these are holes or dens previously created by badgers, rabbits or rodents that the coyote has expanded. Less commonly there are records of other sites such as logs or under rock crevices or underbrush being used. Litter size is dependent on food availability and coyote densities but the average litter size is five. Both parents tend to the pups that are born helpless with eyes that do not open until 9-14 days of age. Pups do not emerge from the den until 3 weeks of age. When young are old enough to fend for themselves, at about 4-5 months of age, they disperse. Dispersal of pups occurs towards the end of fall, beginning of winter. In early winter more than 50% of the coyote population may be made up of juveniles. Average life span of the coyote in the wild is about nine years. Natural predators of coyotes are wolves and cougars. Home range size varies depending on factors such as prey abundance and season. In BC home ranges average between 10-40 square kilometers. 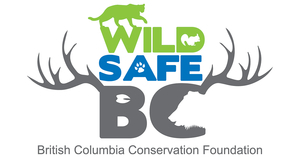 Rabies has not been recorded in coyotes in BC. • Do not feed them. The Provincial Wildlife Act considers it an offense to feed dangerous wildlife. • Keep all garbage secure. 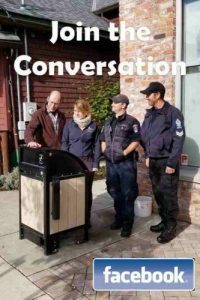 Clean garbage containers, and ensure that they have tight fitting secure lids or use bear resistant bins. Do not place garbage out until the morning of pick up if your neighborhood has curbside pickup. • Ensure your compost is working properly. Composts that emit strong odours are likely not working correctly. Add more brown matter such as soil or leaves, consider adding some lime to aid in composting and reduce odors. Do not add meat products to your compost and make sure the lid is secured, preferably locked. • Pick up all fruit. Consider picking fruit before it ripens and ripening indoors. Contact a local fruit gleaning group to help collect fruit if you are not going to use it and there is too much fruit for you, your friends and family. Consider replacing fruit trees with non-fruit bearing trees to avoid attracting coyotes and other wildlife to your property. • Remove dense landscaping or low branches in your yards and in schoolyards as these provide cover for coyotes and opportunities to reside in our neighborhoods. In addition, the spaces under our porches, sheds and decks can provide opportunities for hiding or denning. Use small wire mesh to seal off these areas and reduce the chance of attracting a coyote to your yard. • Fences kept in good condition, flat to the ground, that are a minimum of two meters tall will limit coyote access into your yard. • Remove bird feeders as the seeds attract rodents such as mice, which then attract coyotes. • Install motion activated lights or sprinklers. • Keep cats indoors. Cats left out at night hunt rodents and birds and become prey themselves. Do not leave any small pets out unattended for long periods of time, particularly at night. • Pick up after your dog. Canine feces can act as an attractant for coyotes. • Coyotes can be more aggressive towards your dogs during January and February when they are looking for mates. It is best to keep your dogs close and on leash. • Do not feed pets outside but if you must, clean up any pet food immediately after feeding. • Remove the welcome mat, make encounters with coyotes in your neighborhood unpleasant for the coyote. Ask your neighbors to do the same. In the event you encounter a coyote that behaves aggressively towards you: make yourself appear large, maintain eye contact, speak in a low firm voice or shout, wave your arms and if you have a walking stick or gardening implement such as a rake or shovel use it as a weapon against the coyote. Throwing rocks or sticks and making noise with pots and pans, or tin cans can also work. If the coyote continues to approach, do not run or turn your back on it, continue looking large and making noise while you slowly retreat. Move towards more people or into your home or vehicle. There have been records of coyotes becoming interested in and/or pursuing children however this is usually the result of habituated food conditioned coyotes during periods of low food availability. That being said it is best not to leave small children unattended where they may encounter coyotes. If you do encounter a coyote pick up small children and slowly back away carrying them. Coyotes that lack fear of humans and/or display aggression towards humans should be reported to the Conservation Officer Service at 1-877-952-7277. • Take all garbage, food related items and items with human scents that you bring into potential coyote habitat back out with you. • In work camps keep all garbage and wastes secured, preferably in bear resistant containers. • Do not approach coyotes. If a coyote approaches you or behaves aggressively towards you make yourself appear large, maintain eye contact, speak in a firm loud voice, wave your arms and throw sticks, rocks or whatever you have available to you at the animal. Report these encounters to the Conservation Officer Service at 1-877-952-7277. With the adaptability of coyotes as mentioned earlier they are often residents of urban areas, if you work in an urban area where you are more likely to encounter coyotes due to the areas you work such as parks, green spaces or waste facilities, or the times that you work such as night shifts it is important to know what to do if you encounter a coyote. Coyotes in urban areas will be more habituated to people and as such may appear bold and display less fear. Refer to the last bullet above on how to handle a coyote encounter. When out recreating in the great outdoors remember to respect all wildlife including coyotes and give them space. See above on what to do in the event of an aggressive encounter. Do not leave any garbage or food behind. • Keep dogs on leash and under control and avoid using extension leashes, especially with small dogs, when out in areas where coyotes are known to be. Coyotes will view small dogs as prey. • Remember coyotes may be more aggressive towards your dogs during January and February when they are looking for mates. • Do not allow your dog to interact with coyotes, even larger dogs, this permits coyotes to become familiar with humans and pets and this increases the risk of negative human coyote interactions. Call the Conservation Officer Service at 1-877-952-7277 to report any coyotes that display aggression or lack fear of people or pets. It is important to note that often multiple prevention or control methods are required to manage coyote damage. There is not a single answer or method that works well across all regions all the time. What works in one area or for one coyote may not work in another or for another coyote. The best approach is always an adaptive one with multiple management tools at work. This does not have to be difficult, in fact, managing coyote depredation on your livestock may be as simple as altering some husbandry practices. • For small scale operations such as hobby farms, bringing livestock into a lit pen at night can be enough to deter coyotes. Also consider penning sheep during rainy or foggy days in a lit pen. Additionally, birthing livestock in a barn or other shelter will protect them from potential depredation as well as inclement weather. Producers that utilize lambing barns or calf into small pastures have substantially reduced depredation rates. • Seasonally risks to livestock from coyote depredation are higher in the spring and early summer when there are greater nutritional requirements to feed pups and sustain the mother. Late spring through till September show the greatest number of livestock losses due to depredation. For most producers this coincides with calving and lambing seasons and the release of young livestock onto range and pasture lands putting them at higher risk of depredation. If possible, lambing and calving times could be altered to result in later seasonal birthing dates. In some areas calving and lambing occur in late fall/early winter. Earlier weaning to prevent putting young out into large ranges or pastures can reduce coyote depredation. When pups disperse in the fall some producers may see an increase in livestock depredation. • Consider using pastures that do not offer a lot of vegetative cover within or adjacent to the pasture during times when livestock are be most vulnerable to coyote depredation. • Portable electric fencing can be a useful tool to create a safer enclosure for livestock at night or during high depredation rate seasons. • Check livestock regularly, human presence and activity can deter coyotes. The lowest rates of depredation from coyotes on livestock is observed in the winter, this is usually when livestock is brought back in close to humans and settlement and opportunities for depredation are reduced. • Remove injured, sick or elderly livestock from your herd, these animals can draw coyotes in, and are a greater attractant than healthy strong animals. • Do not leave carcasses of livestock out on the landscape. This creates a large attractant for coyotes and other larger predators. Bury, incinerate or render these carcasses. If burying, it needs to be sufficient depth to deter predators. • Record predator sightings, incidents and losses. These records can be used to identify seasonal problem areas, or pastures with higher conflict rates and appropriate measures can be taken to reduce conflicts. • Switch pastures. If you are experiencing losses in one pasture, move to another. • Exclusionary fencing is an effective way to greatly reduce depredation on livestock. However, due to the cost of this degree of fencing they are most feasible for small areas, around corals for example. Fencing can be electrified or not. Net-wire or page wire can be effective without electricity as long as it is maintained and meets adequate specifications to exclude coyotes. Fence needs to be a minimum of 1.6m with a horizontal wire spacing less than 15cm apart and vertical wire spacing of less than 10cm apart. One strand of high tensile barbed wire strung along the ground can deter digging under the fence. Another more effective albeit more expensive, way to prevent digging under the fence is the installation of a buried wire apron. To prevent climbing over the fence, an electrified top wire can be installed. There is a significant amount of maintenance required to ensure the effectiveness of an electric fence but when installed and maintained they can be highly effective. All vegetation under and within reach of the wire needs to be kept trimmed or removed to prevent grounding. Chargers need to be checked to ensure sufficient charge and wire tension upheld (90-135 kg). Although the maintenance can be greater than that of traditional fencing, the labor to install electric fence can be as much as 50% less. The most effective electric fence for coyotes has 13 electrified strands. If the cost to replace existing fences is too high, consider modifying an existing fence that is in good condition by adding electrified strands. Please see our section on electric fencing. Note: No matter what type of fencing you install please consider wildlife. Ungulates such as deer can become entangled in fences, in areas with high ungulate populations please review wildlife friendly fencing options and avoid high numbers of barbed wire strands and tall fences in travel corridors or areas with high ungulate densities. • Guard animals can be effective in deterring coyotes. Although guardian dogs, such as Akbash, Komondor, Anatolian Shepherd, Maremma and Great Pyrenees, are the most common guard animal, donkeys, llamas, cattle, goats and mules have also been used. Of these, llamas and donkeys seem to be the most popular and effective against coyotes. • Scare devices such as propane cannons, horns or sirens can be used to assist in deterring coyotes however these devices have limited success as they rely on the assumption that predators will be repelled by strange sounds. Be sure to check local ordinances about their use however. These often works the first couple of times the sound device is deployed but without additional deterring methods used in conjunction to these they will have limited long term success. A good choice if you need time to install more effective control measures. Need to be used sporadically or randomly. • Under Section 26(2) of the Wildlife Act coyotes that are harassing or attacking domestic livestock can be shot or trapped on a person’s property. That being said, persons that do kill or wound wildlife on their property are required by law to report it. 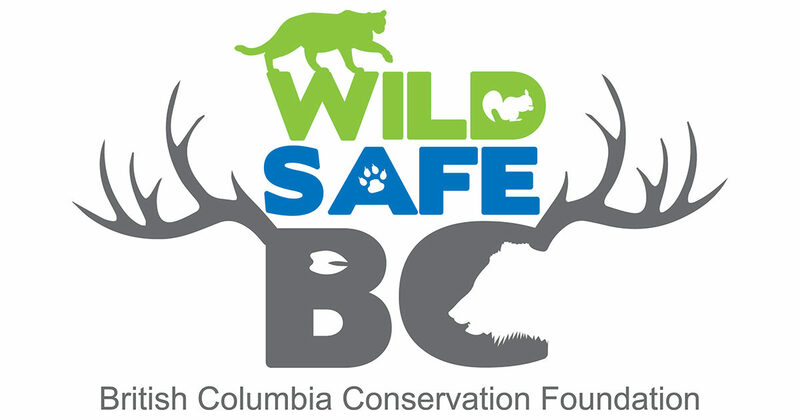 Call 1-877-952-7277 to report dead or wounded wildlife. It is your responsibility to ensure that you are in compliance with all federal, provincial, and municipal laws regarding the use of traps, firearms and other deterrents such as scare devices.